The Novel was written by Michener in 1991. A departure from his better known historical fiction, The Novel is told from the viewpoints of four different characters involved in the life and work of a writer of historical novels concerning a picturesque district (Grenzler) in rural Pennsylvania. There is much discussion of writing, not all of it in support of Michener's own style. Many story devices discussed by the characters are later used by Michener in this same story. The Writer - Lukas Yoder: Narrated by the author of a popular series of historical novels as he works on his "final" novel. The Editor - Yvonne Marmelle: The personal and professional life of Lukas Yoder's editor. The Critic - Karl Streibert: A new literary star appears in Grenzler, and tries to rise from Lukas Yoder's shadow. Early in The Novel, we find that Lukas Yoder has a hobby of sorts: He locates, restores, and then sells (or sometimes gives away for free), hex signs. Above left and right: Note the compass rose-like eight-point star figure on the wall in this scene from Stanley Kubrick's 1999 movie, Eyes Wide Shut. The star here represents, in part, the Egyptian Ogdoad, which, as described in part 1 of this analysis, is a set of four male-female pairs of deities that was worshiped in ancient Egypt. Each of the eight points on the large, outer star here represents one of the Ogdoad's deities, with the four larger points representing the four male deities. Kubrick uses the star to draw a correspondence between the four male deities of the Ogdoad, and William Blake's four Zoas: Each Zoa was associated with one of the four major compass directions: north, east, south, and west. 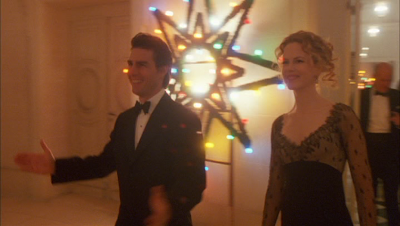 As denoted on the right-hand screencap above, each of the four large outer points on the star from Eyes Wide Shut, can be taken to be pointing to one of these four directions, and thus, each point can be taken to represent one of the four Zoas; thus the correspondence Kubrick is drawing, between the four male deities of the Egyptian Ogdoad, and the four Zoas. Blake, in his later mythology, developed an ogdoad consisting of the four Zoas and their four feminine emanations. He called them the Eight Immortal Starry-Ones. 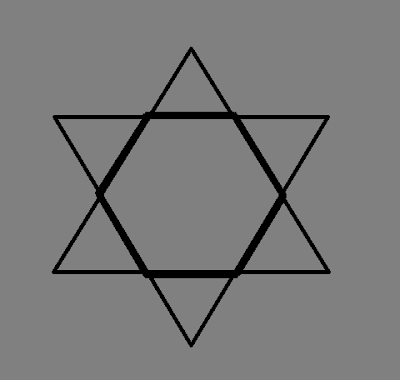 Above left: The Jewish Star of David is a hexagram: Two equilateral triangles, one upright and the other inverted, overlapping each other. Note that the boundary of the interior region of the star has been traced out in heavy lines - this interior border is a regular hexagon (a six-sided figure). 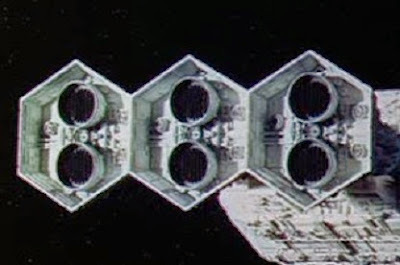 Above right: As described in the analysis of Stanley Kubrick's 2001: A Space Odyssey on this blog, Kubrick uses a hexagonal shape for each of the three rear thrusters of the Discovery One spaceship (shown here). The disproportionate extension of the hexagons in the vertical direction here indicates the predominance of the unconscious mind, which in a man (i.e., 2001 astronaut David Bowman), has feminine characteristics. (For more on the symbolism of the Discovery One spaceship, see the analysis of 2001). 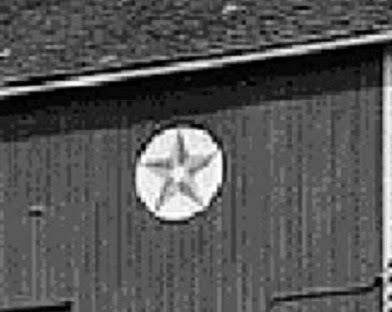 Hexagrams are also featured within and on the outside of many Masonic temples as a decoration. It may have been found within the structures of King Solomon's temple, from which Freemasons are inspired in their philosophies and studies. Like many other symbols in Freemasonry, the deciphering of the hexagram is non-dogmatic and left to the interpretation of the individual. 1. Kabbalah, an esoteric method, discipline, and school of thought that originated in Judaism, is studied in certain non-Jewish organizations, such as Freemasonry, Rosicrucianism and the Golden Dawn. See The Refiner's Fire: The Making of Mormon Cosmology, 1644-1844 by historian John L. Brooke, Ph.D.
Excerpt from this book: "Quite simply, there are striking parallels between the Mormon concepts of the coequality of matter and spirit, of the covenant of celestial marriage, and of an ultimate goal of human godhood and the philosophical traditions of alchemy and hermeticism, drawn from the ancient world and fused with Christianity in the Italian Renaissance. Mormonism and hermeticism both propose a distinct relationship between the visible and invisible worlds. The classical Mormon theology announced by Joseph Smith at Nauvoo in 1844 cast the Mormon faithful not in traditional Christian terms, supplicating divine favor, nor in the role of magicians, manipulating and coercing supernatural forces. Rather, Mormons were to expect, as hermetic perfectionists, to be coparticipants in divinity and to play a direct role in the supernatural cosmos of the invisible world." a. Wikipedia, 'The Novel'. Web, n.d. URL = https://en.wikipedia.org/wiki/The_Novel. b. Image from the Wikipedia 'Hex sign' page; Mascot Mills Barn w Hexes LanCo PA by Smallbones, licensed under CC BY-SA 3.0 via Wikimedia Commons. c. Wikipedia, 'Hex sign'. Web, n.d. URL = https://en.wikipedia.org/wiki/Hex_sign. 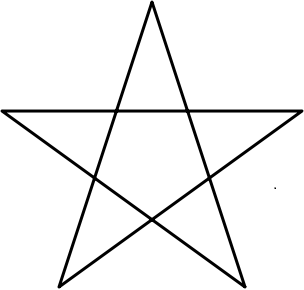 d. Wikipedia, 'Pentagram'. Web, n.d. URL = https://en.wikipedia.org/wiki/Pentagram. e. Boucher, Jules, La symbolique maçonnique, 2nd edition, Paris, 1953.
f. Dictionary of Symbols. Ed. Jean Chevalier and Alain Gheerbrant, Trans. John Buchanan-Brown. London: Penguin Group, 1996. pp. 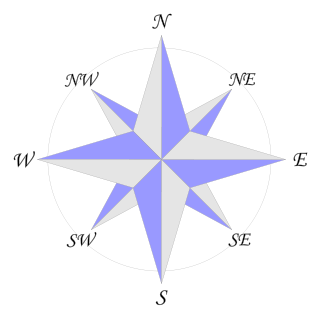 747-748.
g. Image from the Wikipedia 'Compass rose' page; Compass rose en 08p by ElfQrin, licensed under CC BY-SA 3.0 via Wikimedia Commons; edited for clarity. h. Man and His Symbols. Ed. with introduction Carl G. Jung. London: Aldus Books, 1964. p. 240.
i. Wikipedia, 'Hexagram'. Web, n.d. URL = https://en.wikipedia.org/wiki/Hexagram. j. Wikipedia, 'Order of the Golden and Rosy Cross'. Web, n.d. URL = https://en.wikipedia.org/wiki/Order_of_the_Golden_and_Rosy_Cross.